Hire a performer. As a pioneer in the Colorado aerial scene, we also have a strong performance based troupe. Many Aerial Cirque Over Denver (ACOD) students have gone on to perform professionally with international circus companies! ACOD Entertainment performs nationally catering to a host of events including corporate parties, weddings, festivals, and more. Some of our past clients include Denver International Airport (we did the grand opening of the hotel!) Vail Resorts, Budweiser (for their “Whatever, USA” event in Crested Butte), and String Cheese Incident! Meet some of our performers. Solo and group aerial performances along with our popular service, aerial champagne pours! 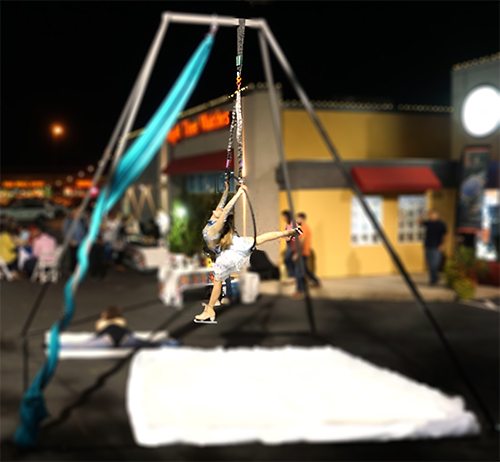 Our most popular aerial performances involve aerial silks and/or aerial lyra. But, we offer much more! If you’re looking for a unique apparatus we offer dance trapeze, aerial cube, aerial heart, pole and more. Send us your ideas – if we can hang off it, we can aerial off of it! The champagne pours involve an aerialist pouring champagne (or any drink of choice) while suspended in the air! I’m not sure aerial is right for our event. Do you offer anything else? 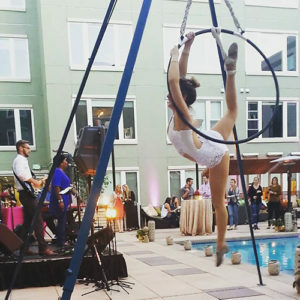 We offer a variety of non-aerial acts including contortionists, stilt walkers, fire performers, tightrope walkers, jugglers, bellydancers, burlesque performers, and our most popular and ritzy ice skating performances! These ice shows are done on synthetic ice meaning they can be anywhere! Indoors, outdoors, in 90 degree heat, or below freezing our ice shows are an exclusive opportunity that will separate your event from the rest. As a large company, we also have many partners and connections, so if you’re looking for something else entirely we can likely arrange! Hire a Performer: What type of performance will I get? I’m not sure our ceilings will work for rigging aerial…? No problem! We have a personal aerial rig that can be set up practically anywhere with a fairly flat surface of about 15ft x 15ft. Sounds interesting, what is the price? This depends on the duration of the event, the style, and what type of act you are looking for so it is very hard to ballpark a price as each event is unique and requires a custom quote. However, most events that are an hour or 2 in duration and 1 -2 performers run approximately $500 for ground based acts up to $1500 for aerial acts, which require more work due to rigging. All performances are customized to your event including music and costumes! If you would like a quote, please email us with the duration of your event, if you are looking for a show or ambiance style, and what type of act (aerial, ground-based, ice show, etc). Some of the best rates in the industry! Higher liability insurance than our competitors with a 2-million-dollar policy. Excellent customer service and years of experience!